Truth Tuesday – Say Yes! At this time of year, I love to sit by my Christmas tree and read various scripture passages telling of the birth of the Savior. This year, I have spent time focusing on Luke 1:26-38. Because my word for this year has been perseverance, I decided to study this passage by thinking how Mary persevered. Picture this young 12-15 year old girl finding out she would give birth to the Savior. She, no doubt, went through months of questioning by family, friends and people in the town, ridicule, gossip, misunderstandings, isolation, and more. I’m sure her mind often had to deal with her circumstances and the emotions she was feeling. Although scripture doesn’t tell us how she handled all of this throughout the pregnancy, I think we can look at her response to Gabriel and understand how her heart responded to these difficult and unusual circumstances, as she persevered through months of uncertainty. Luke 1:38 says she responded to Gabriel with these words – “May it be to me as you have said”. There was no argument, no hesitation – just a simple Yes to God. She responded with a heart of faith expressing that she was God’s girl and could trust His Sovereignty. This is something that I am asking God to show me through this Christmas season. Through all He is asking me to persevere, I want to respond with these words – Yes God…I willingly accept what you are having me to go through right now! I am your girl. I love you and trust you to do what is best for me. Take some time to read the scripture passage above and consider how you can say the same words Mary did, “May it be to me as you have said”, without any questions, complaining, or worry. 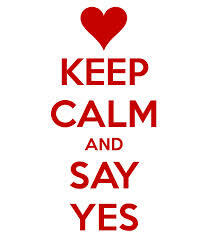 Wishing you a week of saying Yes to your Grace Giver! Saying yes can be a very scary place when we think of the request in our human perspective. Thank you for this reminder to rest in God’s calling.